I believe that stocks printed an intermediate cycle low on 10/29/18. The volatility since then has obscured our daily cycle count. 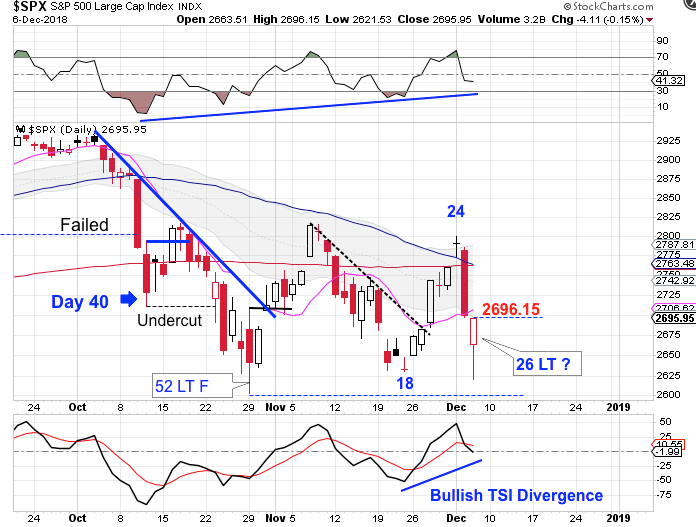 However, Thursday's bullish reversal may provide some clarity. With stocks closing below both the 200 day MA and the 10 day MA as it declined into the day 18 low looked in real team as if stocks were printing an early DCL. But an 18 day DCL was really too early for a DCL to print. On the other hand we have seen daily cycle lows form as early as day 23, so a DCL here on day 26 is certainly possible. 26 days would place stocks a bit early for the normal timing band for a DCL. But following an extended daily cycle this would help to balance out the cycles. There are also bullish divergences developing on the oscillators, which often occur at cycle bottoms. So a swing low and close above the 10 day MA will have us label day 26 as the DCL. A break above 2696.15 forms a daily swing low.